Superb views and small pool in summer. (Ancient Volcanic Landscapes is Section 2 of 225 Miles to Rome, following the ancient Via Francigena. Sections 1 and 3 are 'Tuscan Hills' and 'Approach to Rome'.) Free day in Montalcino, centre of Brunello wine production. Hotel with pool and panoramic views. Inn surrounded by Monte Amiata's chestnut wood. Montalcino to Pescina: Paths through vineyards lead down to the superb Romanesque abbey church of Sant’Antimo. You then continue down through olive groves into the Orcia Valley, before walking up to the forested slopes of Monte Amiata (16.5 miles, 7.5 - 8 hours). Friendly hotel within private park. Friendly, refurbished hotel with family-run restaurant. Piancastagnaio to Acquapendente: Tracks along low ridges with long views bring us to the ancient town of Proceno, from where you descend to the Serlate Valley before walking up to the town of Acquapendente, with its fine square and waterfalls (20.2 miles, 10 hours). Comfortable hotel near the lake. Acquapendente to Bolsena: Forest tracks through the low Monte Volsinii lead to the edge of a wide ancient volcanic crater, then down to the wide blue waters of Lake Bolsena (12.4 miles, 6 hours). 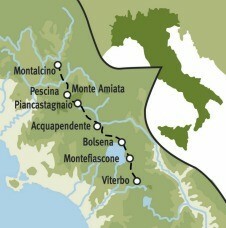 Bolsena to Montefiascone: Ancient paths with lake views lead to panoramic Montefiascone, surmounted by a fortress. Amongst its fine churches is that of San Floriano, which houses the tomb of the bishop whose visit to the town is famously commemorated in the name of its wine: Est! Est!! Est!!! (11.1 miles/5.5 hours). Modern hotel within the medieval city. Montefiascone to Viterbo: Following one of the finest sections of paved Roman road in Italy we cross a plateau, pausing to enjoy Roman baths and thermal springs on the ancient route, before continuing to the walled city of Viterbo (11.4 miles, 5–5.5 hours). Departure day... or continue with Section 3 of the 225 Miles to Rome route: ‘Approach to Rome'. Please note: The Romans rested ‘every four days’. If you plan to walk more than one section of the ‘225 Miles’ we strongly urge you to book some rest days in to your itinerary. Please contact the office for advice. Although much of the walking follows dirt roads, there are also farm tracks and smaller wooded paths, broad gravel tracks and cart tracks. Some field crossings, some thread-like grassy tracks. In the autumn, be prepared to cross a few roughly ploughed fields. May be muddy in wet weather – sufficient ankle support essential. This trip is Grade 3-4. If you are completing all 3 sections of 225 Miles to Rome, the route is Grade 5 due to the amount of walking. Southern Tuscan food is simple and uses excellent quality, local ingredients.You will enjoy fish from Lake Bolsena – corregone, perch and trout, and vegetables from fertile volcanic soil around the lake. Rich and varied pastas, sauces with tomato and peperoncino. Specialities include lamb with wild herbs, ricotta, sheep’s cheeses (pecorino), wild boar and truffles. The trip is a wine-lover’s treat! There are superb local red wines, notably Brunello di Montalcino and Vino Nobile di Montepulciano, as well as the famous Orvieto Classico from Orvieto and Est! Est!! Est!!! from Montefiascone. The trails through chestnut and other nut trees were out of this world as were the fields and meadows with all the flowers. We saw deer, wild pigs, lots of birds and friendly locals - it was all very good. I loved the whole experience countryside, walking, people, weather and food. I was lucky to be there over the Eastertide celebrations. Is there no hotel upgrade option on this trip? Thank you for your query. On this route due to the very limited accommodation options there is only one ‘standard’ of hotels offered. Meteorological records for the area, taken over a period of more than 10 years, are represented in the Weather Chart provided with each itinerary.showers; evenings can be a bit nippy. In April the air is fresh, the sun warm, and there are likely to be (occasionally heavy) showers; evenings can be a bit nippy. In May the temperatures warm considerably In May the temperatures warm considerably. 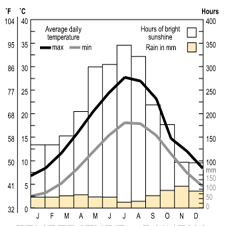 Daytime temperatures from mid May through June will feel hot if you are travelling from more temperate climes. If you are fit and can cope with very hot, sunny conditions, you may wish to consider July and August in order to enjoy the benefits of a quiet period as many other tourists and locals head for the mountains or coast; stamina and heat/sun resistance, sun cream and hat will be required. Early September is still hot and dry. Throughout these summer months, the periods of hot, sunny days are punctuated by brief but dramatic thunderstorms demanding proper waterproofs. Mid-late September offers increasingly pleasant temperatures and in October the air becomes fresher, the views longer, while returning rains turn the fields green again. This trip is Grade 3-4. If you intend to walk the full 225 Miles to Rome (to include Tuscan Hills and Approach to Rome), you should consider the overall Grade to be 5 (the highest level), due to the sheer volume of walking. You need stamina to complete the route all the way to Rome. This is an 8-day trip of which 6 days are spent walking. The length of each day varies from 5 hours to a maximum of 10 hours walking. Hours of walking, which may vary from individual to individual, means hours of actual walking and does not include stops for lunch, sightseeing, rests or siestas. On certain days the walk takes you into the hills where the paths cross a more rugged terrain that may be muddy in wet weather – please make sure that your foot­wear provides sufficient ankle support. The walking is reasonably demanding: there are no free days. Although much of the walking follows dirt roads, there are also farm tracks and smaller wooded paths, broad gravel tracks and cart tracks. Some field crossings, some thread-like grassy tracks. For those planning an autumn trip – do be prepared to cross one or two roughly ploughed fields. There are no vertiginous patches. On day 2, there is a (surprisingly!) steep ascent through wild country to Pescina on the slopes of Monte Amiata; and on day 4 there is an open, unsheltered section of route on approach to Acquapendente. If you have any concerns about these sections, please discuss these with your Route Manager, who will advise you about options if you would like to walk only part of the way. The recommended destination airports for this route are Pisa, Florence and Rome (Fiumicino and Ciampino. The nearest train station to Montalcino is Buonconvento. From Buonconvento you can either take a bus, or taxi (15-20 minute drive; approx €30) to Montalcino. www.tiemmespa.it/index.php/Viaggia-con-noi/Orari-e-linee/Siena/Extraurbano - scroll down (click on 'mostra altri' to scroll down) to timetable 114A. Beware the symbols that may indicate services that do not run every day! NB: Please remember to validate your train ticket by stamping it in the green and white or yellow machines at the start of the platform before you board the train; you can be fined if you have not done so. 'PisaMover', a high-speed, fully-automated rail link takes you from Pisa Airport to Pisa Centrale train station in the centre of Pisa in less than 8 minutes and departs every 5 to 8 minutes between 6.00 am and midnight 365 days a year. Cost: € 2.70 per person one way. Tickets can be bought at the biglietteria (blue ticket machine) at the airport station. You may be able to buy a combined PisaMover and train ticket to avoid queuing again at Pisa Centrale. You can also catch a taxi from the airport to Pisa Centrale station which can take as little as 5 minutes. The railway ticket office is at the far right hand end of the hall as you exit baggage reclaim into Arrivals. From Pisa, there are 3 possible train routes to Buonconvento and once you know your time of arrival at Pisa airport (where baggage reclaim is not usually too slow) we strongly recommend you consult the excellent www.trenitalia.com site to assess your most convenient train schedule. If you fill in your date of travel and starting/finishing points for the train journey, the site provides an extremely clear table of all departures between Pisa Centrale and Buonconvento that day. The last train from Pisa Centrale is at 17.07 arriving in Buonconvento at 20.30 where there are bus connections for Montalcino at 21.00 and 21.50 (journey time approximately 30 minutes). Alternatively, a later train (18.54) from Pisa Centrale to Siena (change at Empoli) arrives at Siena at 20.38 (approx cost €10), still in time to catch an onward bus connection to Montalcino from Siena (21.15). Pisa – Montepescali – Buonconvento. The journey time from Pisa airport to Buonconvento (Mon-Sat, across all routes) varies between 2.5-4 hours, depending on the connections and types of train used, slower on Sundays. The cost of the train ticket ranges from €12-€30, depending on the trains used. The journey to Siena is a little under 2 hours and slightly cheaper. There is a regular “Vola in Bus” bus service that runs from the airport to the central Santa Maria Novella train station (Firenze SMN) and the adjacent SITA bus station (journey time approx 30mins, cost €5) . Alternatively, a taxi to Firenze SMN station would take approx 15mins and costs from €25 (allow €1extra per item of luggage). Train: From Firenze SMN it is a straightforward train journey to Siena which may or may not require you to change trains at Empoli (journey time approx 1.25 or longer if you have to change; cost approx €9). For timetables see www.trenitalia.com. Bus: The regular buses from the central Firenze bus station to Siena, unfortunately do not arrive at the terminus from which the buses to Montalcino depart. For this reason it is probably better to travel by train to Siena. From Siena train station (Siena FS) buses depart for Montalcino (see start of travel section). Or you can take the train all the way to Buonconvento (from €12) and then a taxi from there to Montalcino. From Roma Termini train station in the centre of Rome there are regular trains to Buonconvento (3.5 hours, change at Grosseto, €18-€34). For the bus from Buonconvento to Montalcino, see above under Pisa or Florence. Fiumicino Airport to Termini by train: The “Leonardo Express” train runs very frequent services 7 days a week to Roma Termini station. Journey time is 30mins, costing €11-14. NB there are also trains to Buonconvento from Roma Trastevere station, which is on the Leonardo Express route. Check timetables to determine if this departure point may better suit your schedule. Fiumicino Airport to Termini by bus: There are SIT BUS SHUTTLE buses that go to Roma Termini train station. Journey approx 1hr, cost is €6. (There are also very limited COTRAL buses). We can book you a taxi to the first hotel. The taxi from Pisa airport to Montalcino holds 3-4 passengers (depending on luggage), takes just under 3 hrs and costs approx €280. A taxi from Florence airport to Montalcino takes 2 hrs and costs approx €200. A taxi from Rome Ciampino airport takes approximately 2hrs 40 mins and costs approx €360. A taxi from Rome Fiumicino airport takes approximately 3hrs and costs approx €360. Prices may alter at weekends, Bank Holidays or late at night. After descending the bus in Piazza Cavour in Montalcino, the Dei Capitani hotel is only a 200m walk away down Via Lapini. The Dei Capitani hotel does not have a car park in which you can leave a car, but there are some free spaces and some paying car parks close by. However, please be aware that these car parks are unsupervised. Montalcino is a fairly quiet rural town. Our Tuscany walking holidays are wine-lover’s treat. There are superb local red wines, notably Brunello di Montalcino and Vino Nobile di Montepulciano, which complement Tuscan cuisine very well. Further south, enjoy the famous Orvieto Classico from Orvieto and Est!Est!!Est!!! from Montefiascone. All have WIFI except the Silene and Toscana. All have hairdryers except the Silene. None offer a laundry service. The recommended airports for this route are Pisa, Florence and Rome. There are buses and trains to Buonconvento from Pisa (2–3 hours, €11-€24 ), Florence (2–3 hours, €11) and Rome (3 hours, €18-€34). From Buonconvento it is a short taxi ride to Montalcino (~€30). Taxi costs to the first hotel: From Pisa ~€280; from Florence ~€210; from Rome ~€300-320. Prices may be significantly higher on Sundays and public holidays. Taxis can be booked via the ATG office. For more detailed travel information see the Frequently Asked Questions.